A great trail camera can be hard to come by. Why? The simple answer is because it should be sensitive enough to capture every little motion, but at the same time, also be sturdy to withstand all types of weather conditions. Further, it must also be a breeze to set up and use because not all people purchase trail cameras for the sake of monitoring wild game. Good thing, a lot of new releases of trail cameras have these very features. The problem lies in keeping everything balanced. What are we talking about? We are pointing to the fact that not all trail cameras in the market can deliver on their promising features. It is hard to get a trail camera wherein all the listed features are working well. 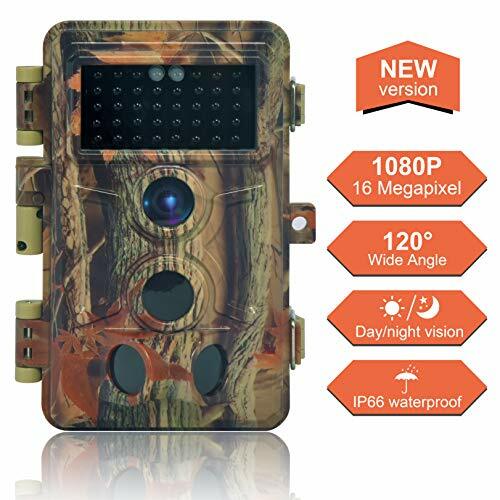 In short, you should expect a trail camera that captures great image to have low motion detection, or a trail camera that is hypersensitive can be a bit flimsy, and so on and so forth. But the Digitnow Trail Camera claims to have it all. Not only that, but it also claims to be the best of the best. Once and for all, we are now going to review all the claims of this trail camera to see if there are any truth to them. We are also going to take a look at its pros and cons to see if this camera is worth your hard-earned money. Itching to know if this trail camera is one of a kind? Then, keep on reading. Let us first take a look at the features of this trail camera. For its exterior, just like any other trail camera, the unit itself is protected by a fatigue case. It is done as such so that it will easily blend with its surroundings when mounted to a tree. Moving on to the quality of its camera, it has an 8MP CMOS sensor, a 16MP color resolution that is HD, and a 1080P video that is also HD. There are also multi-shot modes too. It boasts 0.2 seconds of trigger time with the help of the PIR sensor. At the same time, it has a 130-degree wide view angle lens. Moreover, it also has a choice between flextime and time lapse. For those who give importance to the quality of images and videos, the redux anti-blur technology will take care of that. There are also features that solve the problem when taking images at night as it has a low-glow, infrared LED that is covert. In fact, it boasts 40 pieces of 940NM LEDs, which can provide 20 meters or 65 feet of range when in the dark. A thing to note is that it does not produce a bright flash, so it will not scare the wildlife. Further, it has a waterproof function up until IP66. Also, it can still work well under extreme temperatures as it can hold its own from -20°C to 60°C. As for its screen, it has a 2.4-inch LCD in which you can also personalize the look of the display. It is powered by 8AA batteries. Lastly, a package includes the trail camera itself, a strap, a USB cable, and a user manual. The trail camera can also support an SD card that is up to 32GB, but this is not included and can be bought separately. High Quality Day & Night Camera: Large aperture CMOS sensor, Up to 16 MP HD color resolution and 1080P HD video record, multi-shot modes available. Support invisible infrared flash illumination technology. It can catches every amazing moment that cannot be easily discovered by people in surprised time. Fast Trigger & 120° Wide Angle: Provide surprising faster trigger speed within 0.2 seconds with the PIR sensor. Each detected moment will be recorded instantly and guaranteed never miss any shot. The 120° wide view angle lens captures more abundant view and intuitive object ,Flextime + Time Lapse / Redux Anti-Blur technology to deliver high quality photo and video. IP66 Waterproof: DIGITNOW! IP66 wildlife camera can work under extreme temperatures of between -20°C to 60°C which makes the camera perfect for safe & outdoor use including garden security, wildlife monitoring, surveillance and scouting game. More: 2.4"LCD screen, viewing recorded videos and images, personalizing your setting etc. Support SD card up to 32GB(not included).Up to 8 Months Long battery life with 8AA batteries(not included). 18 Month Warranty. The Digitnow Trail Camera is a trail camera that balances out its features. It can capture high-quality images and video but not at the expense of your stress. This is the case because it is easy to mount and to set up. At the same time, you do not have to worry about it breaking down because it is weatherproof. More than that, the captures at night will also be clear due to its redux anti-blur technology. They might not be colored, but nonetheless, you get clear shots. However, its biggest flaw is the fact that the recording time is not continuous. At some point, the video will stop, so you might miss precious moments. Let us now compare the Digitnow Trail Camera to a similar product, which is the Apeman Trail Camera. Just like the one from Digitnow, it has good features in terms of capturing images and videos. The same goes for its ability to work against harsh conditions. The difference is that the one from Apeman will run out of battery power, even before you settle in at night. It takes so much juice from the batteries, and you will not even realize that it is already dead because it will not give you a signal or at least a warning. At the same time, its night vision mode produces a type of flash. If you have been hunting for a long time, you know that this is bad news because this means that it will spook some animals. This light defeats the purpose of having a trail camera because the essence of having one is so that it is undetectable by wildlife. So, which do you think is the better trail camera? For us and for many others, the Digitnow Trail Camera is definitely the better choice. The video recording duration might have turned you off, but it is significantly better to have cut up footage of something, rather than footage of nothing. The footage of nothing that we are pertaining to is the one from Apeman. At least, with the Digitnow Trail Camera, you can use the product for its exact intended purpose. It just so happens that it cannot shoot long videos. But, again, other than this problem, you have yourself a trail camera that is highly sensitive and can take clear images. Surely, the Digitnow Trail Camera is not the best in the market, but it is an all-around trail camera that you can rely on every time you go hunting in your wilderness.